On Monday, July 30, 2012, I had the wonderful experience of leading an NBR Q and A with actors Susan Sarandon and Frank Langella following a screening of Robot and Frank. They were joined by the young filmmaker Jake Shreier, who was directing his first feature, and writer Chris D. Ford, who was also having his maiden feature experience. Each enjoyed discussing the evolution of characters from script to real-life, the experience of production, and the implications of robots in our near future. Of all the filmmakers and actors I have had conversations with, Langella stands out as one of the most compassionate and thoughtful. Some of it may have been his commitment to the role, which is the mark of a professional. But he is also unusually attentive, thoughtful, and funny. Originally published on August 17 on the website of the National Board of Review. Robot and Frank, set in a small affluent upstate new york town, is the first feature by director Jake Schreier and the story is built around a fascinating premise. Taking place in “the near future,” the film explores the dramatic possibilities of a relationship between a man who may be losing his mental bearings and a household robot. Frank Langella plays Frank, a loner who has sheltered himself into a small country house and is determined to get by on his own. He is especially dismissive of the two people who try, in their own ways, to help – his son Hunter (James Marsden) and daughter Madison (Liv Tyler). Madison is a world traveller who occasionally checks in with short video communications from far off lands while Hunter, who lives within a long driving distance, has lost patience with his father’s declining state. Meanwhile Frank’s life is becoming more chaotic, his house is a mess, and he seems to relate to only one person – a helpful librarian named Jennifer, played by Susan Sarandon. Sarandon makes much from a relatively small role, creating a warm and believable small town character who seems protective of Frank, even allowing him to lightly flirt with her. Jennifer is also facing a transition as the quaint library is being taken over by a young, rich, and very stylish man (convincingly played by Jeremy Strong). Jake is drenched in the quasi-religious fervor of a mission based on modernism and new technology. One day Frank steps up to the reference desk and is befuddled to confront, instead of Jennifer, a short squat robot – effectively a refrigerator-like appliance with an eagerness to assist him. Later, when confronted with his son’s plan for an automated caretaker, a white robot the size of a small teenager with a blank face and helpful personality, Frank refuses to cooperate. True to the buddy-film genre, there is a gradually developing relationship about to unfold. The screenplay, by Christopher D. Ford, is based on a short film he made in graduate school and it hits home in a number of ways: it addresses the encroachment of technology into all aspects of our lives, explores the question of how close to human the computer mind can become, and, most succinctly, gives Langella the resources as an actor to confront memory loss, old age, isolation, and the will to rise above his circumstances. Although it is not an action story the narrative moves forward in physical ways that often do not rely on dialogue. The first thing we see, for instance, is a man in a dark room, slowly searching through drawers and desktops, peering through the shadows with a small flashlight, his half-hidden face seeming to look for anything of value to steal. But our perception of the moment is suddenly clarified when the “prowler” picks up a photograph and examines it closely. It is him (Frank) as a younger man, with his arms draped around a young man and a young woman. He is jolted by the image and we, the audience, realize that Frank is a man in conflict with his own mind. The story plays the generational card quite effectively, pitting Frank and Jennifer against a young and encroaching world that seems intent to use technology to marginalize and ultimately replace them. She is experiencing the demise of the classical library profession, having been displaced by a work robot, and he’s been left by his family alone in the house with a metallic walking talking computer. This unlikely bond between two seemingly very alone people, will develop in surprising ways as the plot develops. Peter Sarsgaard’s robot voice is very effective and grows on the viewer as it begins to endear itself to Frank – he sounds a lot like Hal from Kubrick’s2001, but more mellow, friendly and helpful. Not much more high tech than the unnamed robot (played by Bob May) in the 1960’s TV series Lost in Space, Frank’s robot (also unnamed) is a played by Rachel Ma, who performs inside the the costume as though it were a giant puppet. Programmed to assist Frank in every way, the robot first annoys him but then begins to get his attention with healthy meals and good advice. The narrative kicks in when Frank’s troubled past and his confused present intersect with his recognition that he can exploit the robot’s abundant skills and desire to help. There is an inevitability to the relationship that develops between the lonely senior citizen and his quaint mechanical assistant. After a series of capers that are both comic and moderately suspenseful (one involves the “liberation” of something valuable from the library that Frank touchingly and wrongly thinks will endear him to Jennifer), the story elevates the emotional stakes when it becomes apparent that Frank’s accomplice is also becoming his friend. Langella’s enthusiasm and dedication to the role of Frank lifts the film on his broad and skilled shoulders and makes everything else feel real and believable. His portrayal of a man who is proud, aging, and struggling with memory loss is pitch perfect. An actor who has excelled on stage and screen for almost fifty years, Langella knows how to create a character in front of the camera with subtlety, nuance and conviction. There is nothing to pity or feel sorry for in the character he creates. On the contrary Frank’s ingenuity and self-sufficiency, combined with the slowly evolving acceptance of the robot as a useful and desired companion, can be seen as a hopeful celebration of how we can embrace the journey into old age – and still have fun. Robot and Frank will play well with older audiences – but it is probably not a film that younger people will be drawn to. The robot, endearing but intentionally retro, does not have the flair of a CG creation. It has no special powers, no laser weapons, and feels more 1940’s than futuristic. Though written, directed and shot (the workman-like cinematography is by Mathew J. LLoyd) by thirty-something filmmakers the perspective on generation Y is humorously (and refreshingly) dark. If there is cinematic justice,Robot and Frank will find its niche and do well, especially in relation to the film’s low budget. It is opening in New York City at the Paris, a boutique theater that caters to the film’s demographic and should be a good place for it to develop word of mouth enthusiasm among thoughtful film goers. 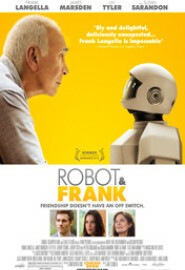 Robot and Frank is a fine debut by Jake Schreier, who really knows how to let Frank Langella take over a role. This entry was posted in Film Reviews and tagged Frank Langella, Jake Shreier, Robot and Frank, Susan Sarandon, Thomas W. Campbell by Thomas W. Campbell. Bookmark the permalink.